Exquisite packaging is a marketing strategy employed by many luxury brands. Custom printed ribbon is often a central component of a carefully crafted packaging system. This approach to branding can be particularly beneficial to the chocolatier. A high quality box adorned with a beautiful ribbon will captivate a potential buyer to explore the enchanting product that awaits upon opening. A custom ribbon will place a touch of elegance on gift baskets, boxes, chocolate lollipops or cellophane bags filled with sweets. This beautiful accessory will add a level of sophistication to your products and your brand. We at Ribbon by Design believe that there are many reasons why integrating custom ribbon into your merchandising strategy is important. Most luxury brands can be identified through their packaging choices. An elegant logo printed on a soft satin ribbon in a beautiful color palette will elevate your brand and become more impactful than a business card. One of the most important elements of a marketing strategy is effectively promoting your brand. We feel a custom printed ribbon is a great way to add another layer of marketing to your product, while also creating a stronger overall brand identity. When our customer, The Golden Turtle Chocolate Factory, sent us their logo we collaborated on re-working it for custom ribbon. We felt that adding a fews small elements could bring a sense of elegance to their brand. Our design team made some color changes to their existing palette and added a subtle stripe to the background. These small additions to the logo created a depth of sophistication to their brand. The recipient of a box of chocolates enrobed in this beautiful ribbon will instantly know what a special gift is inside. Today’s world allows for anyone to produce an item and sell it, but luxury status is carefully curated by a team of professionals. Beautiful packaging incorporating your logo on a rich fabric ribbon ensures your buyer great care was taken with every element of your product. Captivating packaging is associated with many luxury brands like Mason du Chocolat, Jaques Torres Chocolate and Jaques Genin of Paris. An elegant event like a wedding, bar mitzvah, bat mitzvah or corporate celebration will call for a very special favor for the guests. A gift of chocolate is always appreciated. 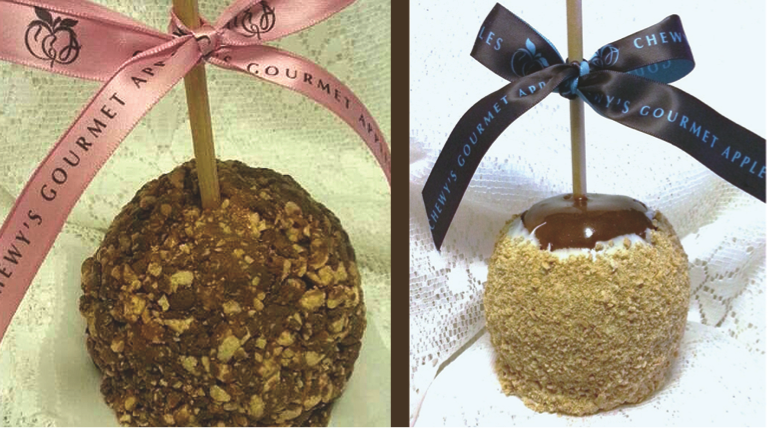 There is nothing more wonderful at the end of a beautiful evening than a perfectly packaged sweet treat. If you are the vendor selected to provide a thank you gift, adding your custom ribbon to the box will serve to communicate your brand to the recipient. Ghyslain Chocolatier adds a their sage and brown signature ribbon to every small gift box taken home by a guest so that everyone knows where the treat was made. 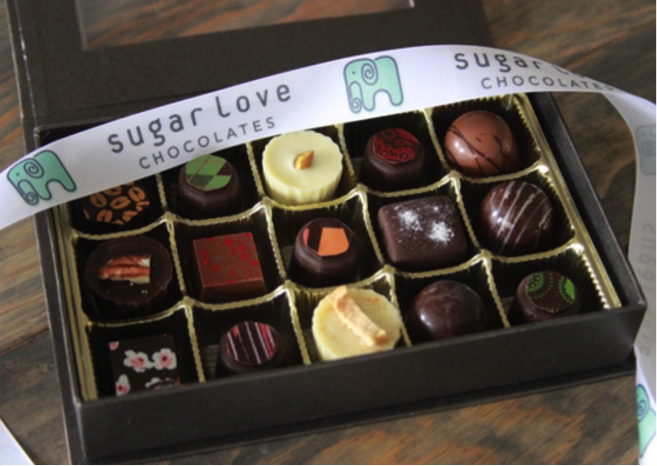 Sugar Love Chocolates created Ellie the elephant for their logo. This adorable little creature is a fun mascot that will always be associated with the brand. A timeless combination of your logo, and color palette will cement your brand’s image in a similar way. Once you have all the elements of a great logo, let us heighten your brand awareness with an enchanting ribbon. Make your business stand out by adding a beautiful custom ribbon to your packaging suite. This is the ideal way to elevate your brand and impress your customers. Our precision printing methods are a permanent process. Our ribbons are dyed with inks to perfectly match your carefully designed logo. We have no color or design limitations in our print technology. We pride ourselves with perfect color matches, beautiful design work, fast turn times and competitive pricing. Contact us for more information about our custom ribbon process.